Technology is great! It helps us stay in tuned to the world and makes it easier to stay in touch with one another. Whether it’s an email, a text, the TV, or a video game, electronic devices keep millions of people connected 24/7. Electronics are an amazing advancement that we all use as part of our daily lives, but are we fully aware of the price we pay for being so attached? These diversions could be keeping us from both falling asleep and sleeping soundly throughout the night. Let’s take a look at some of the effects electronics have on our sleep! While it may be tempting to finish that last level of Candy Crush on your smartphone while lying in bed (which I’m totally guilty of! ), studies have shown this may have negative effects on our sleeping patterns. The artificial light emitted by your phone signals your brain to stay awake. Our bodies naturally grow accustomed to thinking light equates to daytime. Therefore, when exposed to the light emitted from our devices, our brain produces less of the hormone Melatonin. This hormone is produced in the absence of light and helps to regulate sleep. The less Melatonin the brain produces, the less regulated our sleep becomes – resulting in more tossing and turning throughout the night. In addition to light affecting sleep, the stimulation produced from playing that addictive game can also affect our shuteye. As your brain revs up, its electrical activity increases and neurons start to race. This is the opposite of what your brain should be doing before sleep. Instead, experts suggest reading a (physical) book to help your body wind down before bed. So maybe try to finish that last level of Candy Crush prior to lying down in bed. Or if you must finish that Mystery Quest to get to the next level try dimming your device’s brightness to help keep Melatonin secretion at more reasonable levels. Staying connected to friends, family, and work is a great benefit that electronic devices provide for us. But it can also have negative effects on our own health in terms of the amount of rest we each night. If you have that one friend who travels all over the world, and they just sent you a text with a picture of them at the Eiffel Tower. It’s daytime on their end of the world and it’s midnight for you, but you heard the buzz of your smartphone go off and you just had to see who is texting you in the middle of the night. This is the difference between a full night’s rest and one filled with wakefulness. Additionally, your mind subconsciously reacts to noise. 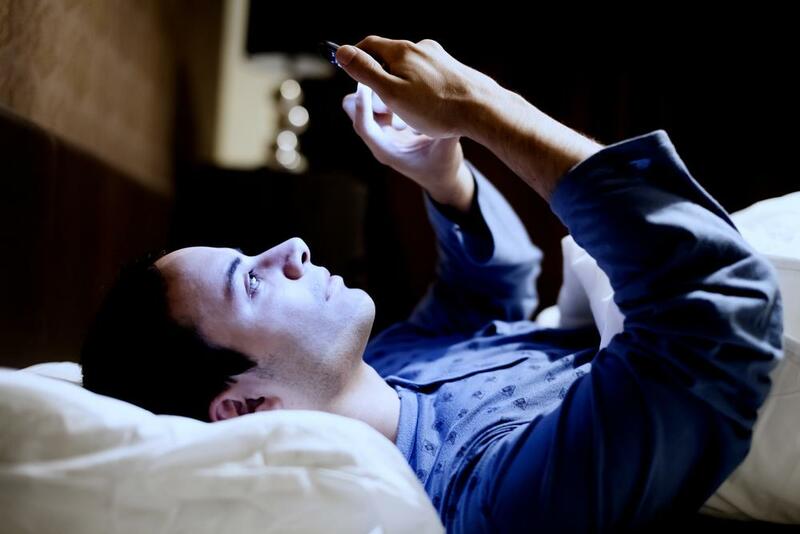 So even that notification from an app can be affecting your sleep! Try turning your phone off for the night, instead of turning it on vibrate. If you must be available by phone for any reason, then use the “interruptions” or “do not disturb” feature that most smartphones have now. This feature only notifies you of phone calls from those of your choosing. Sometimes it’s hard to unplug from the electronic network that can be so fun and addicting, but it’s important to remember that in order to keep yourself up and running, you need a proper night’s rest. I can’t stress enough on how important sleep is. You spend one third of your life sleeping! So do your part to keep your body rested by putting your phone on silent, dimming it’s brightness, or turning it off completely. Because even though your friend sent you an awesome picture of her swimming with dolphins in the Bahamas, that picture will be even more awesome after you’ve had a great night’s rest!